Visiting various native villages in the Bering Sea region of Alaska and Eastern Siberia was for me and my wife a joy, and an opportunity of a lifetime. This photo was taken in the village of Savoonga on St. Lawrence Island, during a welcoming ceremony put on for the 100 or so visitors from our small cruise ship. We were in a relatively small school gymnasium, which was, to say the least, VERY crowded. Also, lighting conditions were not that good, so I had to crank up the ISO on my camera (800), and use a 300mm lens to get up close to subjects I wanted to photograph. 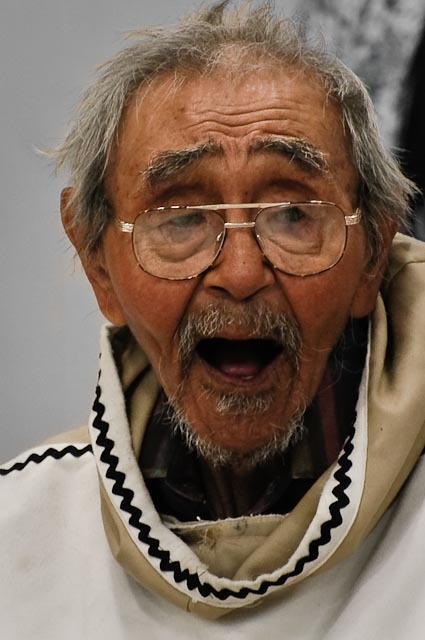 This old man was singing at the top of his lungs, along with several others, and the sparkle in his eye and enthusiasm and pride in his Yupik native culture was inspirational. I had to hand–hold my camera, propping it up on my knees as I sat on the floor watching. It’s a bit fuzzy and grainy,(1/25 sec) but I still think it captures his mood quite well. I sure would like to go back and visit this village again some day; but alas, that will most likely never happen. Like I said, we’re very grateful that we had an opportunity to go where many like us have never been. Next PostNext This is how it’s done!